Ramadan Mubarak to all our followers. Please consider us also in your prayers. May we all have a blessed Ramadan. Ramadan is the holiest month in the Islamic calendar. Muslims around the world abstain from eating, drinking, conducting sexual relations, and other physical needs during the daylight hours. They consider this holy month as a time to purify their souls, refocus attention on God, and practice self-sacrifice etc. You can learn more about Ramadan here. Let me share some of our best iftar recipes for this Ramadan. Try these recipes for this Ramadan and let me know your thoughts. If you want to share your recipes, please feel free to submit it. Light and nutritious foods are ideal during Ramadan. Soups, Breads, fresh fruits and vegetables are the best way to begin and end the daily fast. When hearing about the foods in Ramzan this will be the first food that comes to the mind of a Kerala Muslim. Pathiri is a traditional and authentic food item of Kerala Muslims. Its a pancake made of rice flour. Its known in a wide range of names like Ari pathiri / nice pathiri / pathil etc. Pathiri is usually served along with meat or fish curries for breakfast, dinner,iftar etc. Its an inevitable part of Malabar Muslim cuisine. Pathiri definitely needs a non veg curry and lets have a mutton curry together with it. Try this spicy mutton curry recipe yourself and let me know your comments. You can serve it with Appam, Idiyappam, Pathiri etc.. Need some thing dry to serve with pathiri and mutton curry? Most of you may have taken this Chicken pepper fry from outside restaurants but wondered of how to prepare them at home. Then here it is. Chicken cutlets are an easy to prepare iftar snack food which I am sure your Kids and other relatives will love. It is prepared from minced boneless chicken and mashed potatoes. This recipe will give you an awesome chicken cutlet. Unnakaya is a sweet Malabar (Kerala) Muslim recipe. 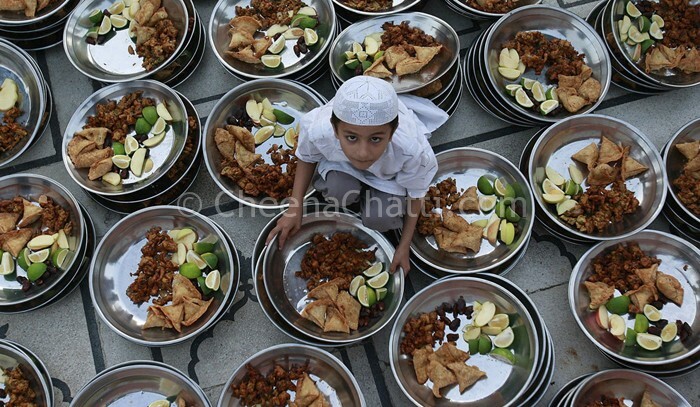 Its popular in other parts of Kerala also during the Ramadan fasting time. Unnakaya is a good snack item which can fill the snack box and can be served as an evening snack for your kids. We need a juice recipe also for breaking the fast. Here is a recipe of refreshing mint with lime. This mint lemonade is also good for your digestive system. Chicken Majboos is an Arabian rice dish similar to Kerala Biriyani. Some people also call it as Arabic chicken Biriyani. This is a popular dish in northern Kerala. Arabian mutton kebab recipe from the native Arabs. Lets have a veg item too in our collection. Sukhiyan is a deep fried traditional Kerala tea time snack made from Green gram / Mung bean, coconut and jaggery filling. This is a highly nutritious food because the mung bean is a rich source of low-fat protein and fiber. I am sure that I missed a lot of recipes. Please share them as comments below or submit these recipes to the CheenaChatti’s Ramadan collection. This entry was written on July 11th, 2013 by Jameela Beevi. Posted in Food collections and was last revised on September 30th, 2013. @Arifa: Thanks for these additions. I haven’t tried cupsa and Banana cutlet before. Could you share those recipes? Thanks, we are opening a new chain of restaurant in Bangalore and can you please suggest best 2 chicken and vegetarian Kerala dishes for our menu. @Rajesh : Have a look at this post. @Sajeev: I’m not a native of Calicut. So offhand I don’t know any good restaurants in Calicut. But my friends recommend Paragon hotel for Malabar recipes. Not sure whether they have all these items through out the year or only during Ramzan. But the restaurant is a good one.